Welcome to the Year 8 page. Read our blog below for all the latest Year 8 news. You will find key documents at the bottom of this page. Last year, LNA was involved in almost all of the house competitions and extra-curricular activities. This year is no different. 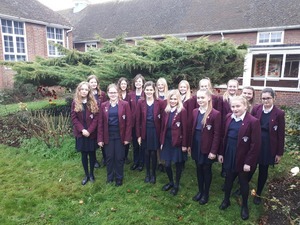 Although we are only half way through the year, students of 8LNA have been involved in the house shout, a recent netball tournament, and are currently preparing for the talent show. At the start of the year, there was a house competition called the House Shout. It was compulsory for lower school students (Year 7 & 8) and optional for upper school. Although our house, Ennis, didn’t win the competition, it was still an extremely fun experience for us to sing ‘ROAR’ and I am sure many of us will join in again next year. On the 5th of March there was a netball tournament at Wallingford School. Two teams from our school participated in the event and five players were from 8LNA. There were two leagues at the tournament, the A league had seven different schools involved while the B league had four. Both teams did amazingly well and our school won both leagues for the second year in a row! A huge well done to Isabelle G-B, Isabelle Thrower, Isabel Thornton, Lily-May, Elizabeth R and everyone else who was involved in the competition. With half the year left, there are still many more exciting but stressful events and competitions coming up. Throughout the week beginning 11/03/19 taster sessions are being held, so we can experience what the subjects will be like at GSCE and make an informed decision about our options. Most people have signed up for at least one session and we are all excited, but nervous, as we make our choices. Some students from our tutor group are also preparing for the school talent show. Good luck Shantal, Erin, and Lily-May. We know you will do amazingly. Scarlett Cowley, Jess Hunt and Evie Foster lead and organised this weeks ethos on compassion. The girls spent the last few weeks considering different questions they could ask the class on compassion, including how can we show small acts of compassion to others every day. Some great responses included a suggestion of writing a positive statement to hide round school for others to find! So look out for these! NWR have chosen to write their blog entry on some of the extra curricular activities that NWR participate in ourside of school. Libby Moody is a keen horse rider, she has won many certificates and sashes for dressage. Below is a photo of Libby and Ranger for dressage. On the left, we have Jess Stokes with her horse, Quickstep. Jess is a keen horse rider and every Sunday, Jess goes to Stonehill Riding School. Jess has been riding horses all her life, but came back into it a year ago. Lilly James is also an avid horse rider. Below is a picture of Lilly and Apollo. Lilly spends her time each Sunday horse riding and grooming the horses. Lilly has also been riding since she was young, however, has also come back into riding last year. KES have chosen to write about their experiences with their Chinese exchange students for the Year 8 Blog. Our Chinese Buddies by Ava Corcoran. On Monday the 28th and Tuesday the 29th of January, we had visitors all the way from China. It was quite a experience, ranging from trying to explain what bioaccumulation was to trying not to lose them in the canteen. We had them from SGT to period 4 on Monday, and break to period 4 on Tuesday. One of the most interesting lessons to have them in was PE. As a class we will forever remember Miss Davies trying to explain you put your HANDS then your KNEES on the vault in order to land safely. One of the Chinese students just ran up, took off, landed on one foot on the vault then just jumped straight off! It was brilliant. Explaining bioaccumulation was to them was hard, but I think Jessica in 8DCH summed it up perfectly with ‘small fish has bad thing, big fish eat small fish, big fish now has bad thing, otter eat big fish, otter has too much bad thing, otter dies’. Antonia in 8KES had a buddy who had excellent English, so he acted as translator in most of the lessons. There wasn’t enough space in our math’s classes so we had to take them to various lessons, with my buddy going to a Year 10 English lesson. He probably enjoyed it, because as I was taking him to the next lesson he said ‘Thank you’, but didn’t elaborate, so I’m still not sure what that was for. One thing we did learn was that if you were going to ask your buddy a question, you had to make sure you had their full attention, because if you talked to them in English without making it very clear you were addressing them, they would assume you were talking to someone else and completely ignore you. It all worked out fine, and while Elizabeth in 8LNA still only found out her buddy’s age, but not name, communication was quite clear. At the end we all exchanged gifts. I got a fan and some Chinese dark chocolate in exchange for Eccles cakes and Chorley cakes. Overall it was a great experience and we learnt lots about Chinese culture as well. I would like to thank all the parents that attended the Year 8 PIE last night regarding the Year 8 Options Process. It was lovely to see so many of you there and I hope you all found it useful. A few questions were raised regarding the Year 8 Parents Evening, so I thought I would confirm which tutor groups are on each evening. Before the Parents Evening, there is the Year 8 Options evening on Thursday the 28th of February. This is a fantastic opportunity for yourselves and your daughter to talk to the subject teachers about the GCSE options they are interested in studying next year. I hope that this is useful and look forward to seeing you all on the 28th of February. We are pleased to be able to share with you the Year 8 Vocabulary Booklet. This booklet has been put together with great care by your teachers, to equip Year 10 students with some of the key vocabulary you will need to be successful in your study of these subjects this year. The booklet can be viewed here, which includes information about how best to use it to support your studies. This term each tutor group is going submit a blog entry one a week on a topic of their choice.The idea for this, is that it gives each of the tutor groups the opportunity to present within the blog, on a topic of their choice. We will of course additionally be reporting on student’s success and highlights of the term. Right now our thought for the term is about compassion, a strong feeling of caring/kindness. I myself have seen lots of people really thinking about this and going out of their way to show compassion to others; even if it’s small, like lending someone a book or helping them with their homework, a random act of kindness can really make someone’s day. Additionally, we have been preparing for the upcoming house talent show. It's a great way to score house-points, develop confidence skills and have fun. There's a great variety of acts such as singing, dancing and magic tricks. If you wish to take part then head over to Cockcroft Hall on Friday lunchtime for catch up auditions, may the best girl win! There are lots of things to look forward to this term such as the Computer Science trip to Intel for a coding challenge and a physics challenge day at Oxford University! I'd also like to say a big well done to Kelsey Sym, Shantal Mbaziira and Amber Collins Freeman (Y8) for competing in a swimming competition, we're glad to hear that you won most of your races and wait in anticipation for the overall results. I hope that everyone has had a good term so far and will keep our thought of compassion in mind. 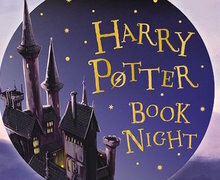 In celebration of Harry Potter Book Night, we are holding a cake competition on Wednesday 6th February. Students wanting to take part should make or decorate cakes in a Harry Potter theme and bring them to the library before school or at break time on Wednesday 6th February. The judging will take place at lunch time, so it is important that entries are submitted before then, and that they are clearly labelled with the student's name. This is a House Competition, with points awarded for the winning entries! As part of our celebrations for World Book Day this year, we have invited illustrator Pam Smy to DGS on Thursday 7th March. During her visit, Pam will be talking to the whole of Year 8 about her book Thornhill and the creative process behind it. Pam has provided the beautiful illustrations to accompany many novels, including some by the award-winning author, Linda Newbery. Thornhill is a wonderfully gothic book, inspired in-part by some of Pam’s own favourite novels, most notably ‘The Secret Garden’ by Frances Hodgson Burnett, as well as Jane Austen’s ‘Emma’. Pam weaves together two narratives: one told as diary entries from a girl writing in 1982, and the other told through a series of haunting black and white illustrations of a girl living in 2017. Thornhill was nominated for the prestigious Kate Greenaway Medal for illustration, and was highly commended at the 2018 Oxfordshire Book Awards. Students will have the opportunity to have copies of Pam’s books signed on the day. Thornhill is available to Year 8 students to order in advance of the event via www.parentpay.com using the payment item ‘Thornhill’ for £10.94. Purchased books will be available for collection from the library on Thursday 7th March. Sofia Dent, Sarah-Jane Abeyesinhe and Kelsey Sym took part in the Beyond Boundaries art competition run by the Museum of Natural History. Year 8 have been learning about the human and physical geography of several countries within the continent of Africa. One of these has been Uganda. One of the largest geographical issues that Ugandan faces if the prevalence of HIV and AIDS. Over the last few weeks, Year 8 have had the task of asking questions and sharing their views of HIV and AIDS with friends and family. This was followed by a written assessment, which details how their chosen solutions to HIV would work in Uganda. 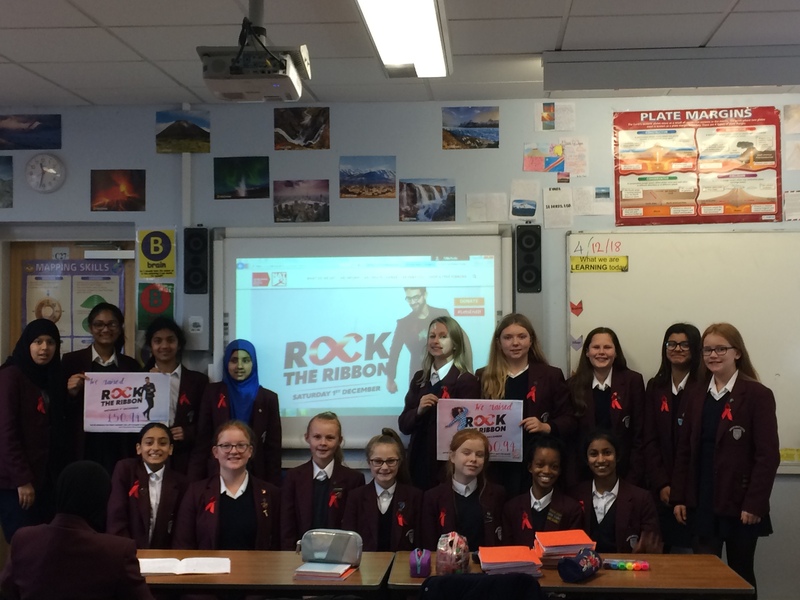 Year 8 have also been very busy raising money through donations to the NAT (National AIDS Trust), for Worlds AIDS Day. World AIDS Day takes place on December 1st, each and every year. It’s an opportunity for people worldwide to unite in the fight against HIV, to show their support for people living with HIV, and to commemorate those who have died. Closer to home, over 101,000 people are currently living with HIV in the UK. Globally-speaking, there are an estimated 36.7 million people who have the virus. There have been staggering developments and scientific advances made in HIV treatment, there are now legislation to protect people living with HIV and we now understand so much more about the condition. Despite this, many still do not know basic facts about how to protect themselves and others. Indeed, stigma and discrimination remain a reality for many people living with the condition. World AIDS Day is important because it reminds us that HIV has not gone away – there is still a vital need to raise money, increase awareness, fight prejudice and improve education. Impressively, Year 8 have raised an outstanding £50.94 for the Words AIDS Day charity. This is truly a wonderful testament to their empathy, compassion and support for a wider community who have HIV and for a very worthwhile charity. Pictured are members of 8YLH, who have contributed towards raising £50.94 for World AIDS Day. Ava Corcoran, Antonia Boboc, Elizabeth Rutterford and Elizabeth Brawn represented DGS as a team in the regional heat of the Kids Lit Quiz. The Kids Lit Quiz was a 10 round competition about all aspects of young fiction. The girls competed against 30 other teams - most of Oxfordshire's private schools were represented - and did so with maturity and dignity. There were only two and a half points between our team and the winning team. Thank you to HEA for helping to attach all the nets to the poppies. Without you they would not have been up in time. As the head of Year 8, I am often told how wonderful the year group are. To see just how wonderful they are, Jackie has been popping into lessons to capture the girls working hard. Here are just a few from Geography, Food Tech and RM. Sofia approached me at the end of last term and requested to lead an assembly on feminism. Sofia explained that she felt passionate about equal rights for men and women and wanted to share her findings with the year group. Over half term Sofia planned and produced an outstanding assembly and requested to deliver it in the next year assembly. Sofia delivered her assembly with such passion and professionalism. She portrayed not only her views but views of other too. She obtained references for her assembly from a book she has been reading Everyday Sexism by Laura Bates. Well done Sofia for leading such an inspiring and thought provoking assembly. Drew Lofthouse was dancing against 75 under 12 girls in a recent Irish Dancing competition. Drew was one of the top fifty percent to recall and placed 37th in Great Britain, one judge actually placed her 14th in one of her rounds. Well done Drew. I thought it would be nice to share all the lovely comments and subject nominations for Term 1 Celebration Assembly. Summer Hawkins 8DCH: Summer has started the topic of Rivers and river systems incredibly strong. She is able to confidently share and give her answers in her lessons. This is an amazing attribute, and is worthy of being shared and celebrated. Well done Summer! Congratulations Year 8 School Council reps who have made a great start to the year, delivering great assemblies, working hard and being very creative in shaping our Choices for Change project and End Period Poverty/Red Box project this term. Mr George says thank you and well done. Izzy Hurst 8LNA - for always doing the right thing at the right time, every minute of every lesson. Daisy Tibbetts 8LNA - for her hunger to improve. Evie Chick - for her dedication and consistency, always doing the right thing in every lesson and club. Miss Anderson would like to say a big thank you and well done to 8X1. Every lesson has been an absolute joy and you are all making great progress. Thank you and keep it up next term! Miss Thursfield would like to nominate Martha Haines 8HEE for excellent effort in Art. Please pass on my praises to the whole of 8LNA who have made a brilliant start to the year, discussing ethical issues in our lessons I am most impressed. In particular, I applaud their interest, enthusiasm, thoughtful questioning and inquisitive approach. Well done, Y8! Keep up the fab work! 8CD3! Thank you so much for all of the creative parallel narratives you have written and shared with each other.I am really looking forward to reading your completed versions. I hope to share some of them on the DGS Blog! Fantastic work Year 8; enjoy your break! Shantal Mbaziira - For always performing brilliantly in Drama, and for coming up with creative ideas. Louise Blake - For gaining confidence on-stage and bringing comedy to her performance. The following girls have impressed me with their work both in class and the quality of their homework. Emma Parks for her attainment in Maths, for always trying to really understand all the content and for asking brilliant questions in Maths lessons. Leah Adams-Strange for her amazing progress and excellent attitude to learning in all lessons! Ashlee Cruthlee and Rosie Beesley. These two worked very hard in Y7, give excellent answers and have continued this effort into Y8! Well done girls. Emilia Friend for enthusiasm, effort and engagement in History as well as helping those around her and Molly Rasmussen for her wide general knowledge about History and for sharing it so enthusiastically. Etholle Wren and Lea Gregory in Year 8. The girls have both demonstrated resilience, independence and have made a fantastic start to Year 8. Sophie Green for her growth mind-set and determination to make the most of every task. Fiona Bull for being consistently outstanding in science - from Mr Low-Hong. Anna Riggs - she has started this year with a real determination. She has used initiative and team work during practical lessons and has a new found independence with written tasks. What a fab term Year 8, Well done! Year 8 have been busy designing their tutor board entries for the competition. Here are the entries, who should win? The results will be announced in the celebration assembly next week. Well done Year 8 they look great! Some pictures from some lovely Art, Drama and Geography lessons last week. Fantastic ethos work completed independently and during student guidance time from Maddie Reiszner and Hannah Ackland-Snow's. Well done to Chloe Cormack (8 HEE) for independently creating this amazing booklet on the Amazon River. Chloe designed, printed and bound the colour booklet over the summer holidays. The booklet details the Amazon River, animal and plant life within the rainforest and is packed full of really wonderful geography, to a high level too. The booklet is something Chloe completed totally independently over the summer holidays. Well done Chloe! Some pictures of some lovely Year 8's enjoying their ukulele lesson on Monday.